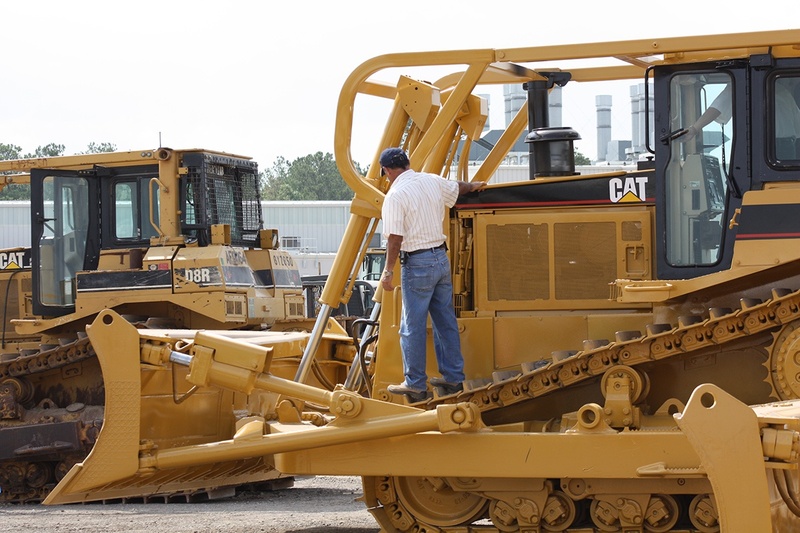 What to look for when inspecting a used bulldozer for sale. When it comes to heavy equipment, nothing is as pervasive as the dozer. It can be found hard at work clearing ground, pushing material, removing stumps or performing rough grading within the construction, agricultural, logging and mining industries. First conceived by Benjamin Holt in 1904, the dozer – or crawler tractor – has been the muscle behind many projects for over 100 years. Check the blade face for any plate lines. Plate lines are visible on blades that have been refaced, showing that excessive wear on the blade has been repaired. 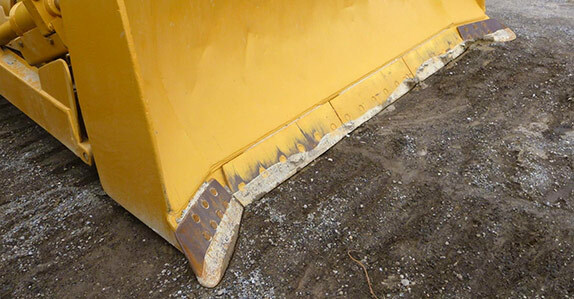 Check the top of the blade, the spill guard, and look for any damage caused by rocks or other heavy material. Move to the bottom sides of the blade and inspect the corner bits for any signs of wear, corrosion or welding. Inspect the cutting edge for remaining wear. Inspect the blade push arms, paying close attention to the trunion pins and caps. If the trunion cap is loose or space is evident between the trunion and the cap, it could be a sign of excessive wear. Check both push arms for any signs of scarring and, in the case of a semi-u or angle blade, check the hydraulic cylinder(s) and rams for any scratches or dents or leaking seals. As the most important part of the crawler tractor, the undercarriage is also the most expensive to repair. Take your time to inspect every component of the undercarriage. Some crawler tractor operators may favor steering left or right, or may have operated the crawler tractor primarily on a side-hill application, causing uneven undercarriage wear, so it's important to check both sides of the undercarriage in order to properly assess its true condition. Areas of wear on rail bushing and link. Start with the rails, also known as chains. Reach under the rail and feel the tops and bottoms of the bushings connected to the rail links. 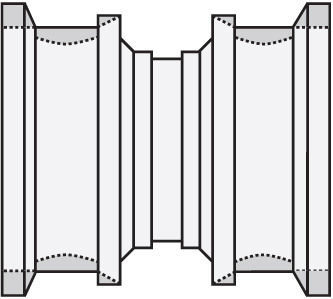 Determine if the bushing has an ideal rounded shape or a compressed oval shape caused from wear. Also determine if wear is evident only on the bottom or on the top of the bushing as well. If you can feel wear on the top of the bushing, that means that the pins and bushings have been turned, leaving less than 50% wear-life remaining. Look at the links and note remaining rail height and uneven wear patterns. Excessive spread may also indicate internal pin wear. Also check the amount of internal wear by measuring how far the slack adjuster has been extended out. 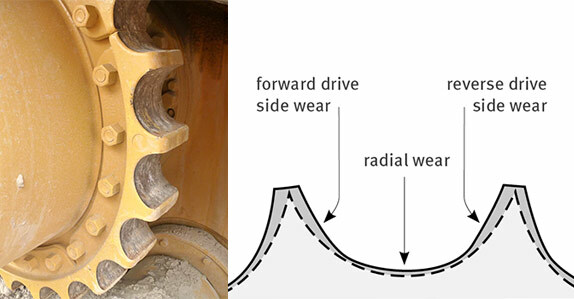 Areas of wear on a double flange roller. After checking the rails, move on to the rollers on which the rail travels. Inspect the top rollers and bottom rollers. Look for cupping on the surface on which the rails travel. Note any damage and excessive flange wear as well. Carry on your inspection to the idlers, looking for surface wear. Check the idler’s overall outer edge thickness to determine the amount of wear. 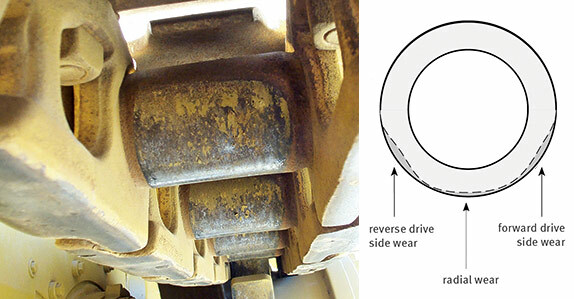 Area of wear on an idler. Areas of wear on drive sprocket. As with the idlers, check condition of the sprocket segments to see if the segment teeth have taken on a sharp, pointed shape or have a noticeably thin appearance. 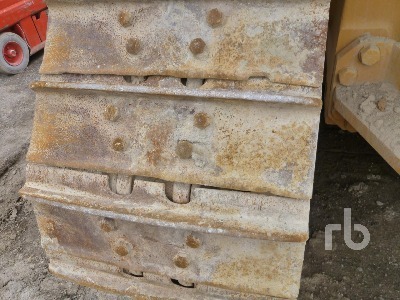 Track pad and grouser bar areas of wear. Step back from the idler and assess the track pads. Check the thickness of the plate and the height of the grouser bar. If the grouser bar is level with the pad bolts, then you should consider either rebuilding or replacing the track pads. Unique to Caterpillar crawler tractors is the use of a high drive system. The high drive system drives the tracks. Check the high drive for any leaks, cracks or any other damage that can affect performance. Don’t forget to check the track frame, sway bars and stabilizers for any scarring caused from coming into contact with hard material or surfaces. Check all hydraulic cylinders for any signs of leaks or damage, including dents or scratches. Open the engine panels and check the engine for any obvious leaks, loose belts and dirty filters. Check all fluids. Look underneath and around the machine for any signs of leaks. When inspecting the cab, make note of the steering system (e.g. differential steering or fingertip control). If the cab is enclosed, check that all windows are intact. In the case of ROPS or other canopy-style enclosure, check for any structural damage to the roof and its supports. Next, start up the machine and look at the exhaust coming from the stack, making note of any dark color, any carbon build up or other signs that the engine may be due for service. Make note of systems included - air conditioning, heating etc. - and test their operation. Take the time to ensure that rear crawler tractor attachments, such as a single-shank or multi-shank ripper, winch, auxiliary hydraulics or drawbar are in good working condition. Rear attachments add value to the machine. If the machine you are planning to buy does not include a rear attachment, search our current inventory for crawler tractor attachments for sale. If you're interested in buying dozers being sold in upcoming Ritchie Bros. onsite auctions, visit the auction site to test, inspect and compare different models before you bid. Or see what’s available for sale on IronPlanet and Marketplace-E, including a large selection with IronClad Assurance Equipment Condition Certification.